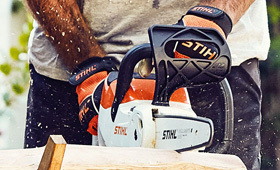 The light weight and superbly balanced STIHL COMPACT Cordless Chainsaws are perfectly suited to pruning small branches around the garden and for cutting up smaller logs for the fire. Impressive run time and quick charging means you can work uninterrupted and for longer to get the job done. The efficient EC motor and cordless technology reduce noise, and the 1/4" Picco chain provides powerful and efficient cutting performance.